On May 15th of 2000, I was diagnosed with an inoperable, stage three, anaplastic astrocytoma brain tumor. Following my diagnosis I was told that I had six to eighteen months to live. So I met with an oncologist here in Los Angeles and in San Francisco, and they were telling me at that time—the oncologist told me, that the protocol for me would be to do Temodar® which is a chemotherapy, followed by a course of radiation. I asked them what that treatment would get me and they said maybe five years. “Maybe five years of life?” So of course I asked what would happen after five years, if I get to that five years and they said “well, we’ll see what’s available at that time” meaning I would perpetually be on a course of treatment. Didn’t sound good enough for me. Also at that time I had heard about Dr. Burzynski in Houston, and I found out about Dr. Burzynski through a friend of mine. But I met with a prominent neurosurgeon here—who wrote off Dr. Burzynski. He told me point blank that “antineoplastons don’t work”. But Dr. Burzynski’s treatment really sounded right to me. So I started on his treatment on June 6, of 2000. In December of 2000, all that was left of the tumor was scar tissue—and again, this was confirmed through an MRI. On October of 2001, I stopped Antineoplaston therapy altogether. I’ve had annual MRIs since that time, so over the course of the last eight years, annual MRIs have confirmed, all that’s left of the tumor is scar tissue—and I’ve been off the treatment for that entire time. So, Dr. Burzynski cured me of a brain tumor. If we review Jodi Fenton’s medical records, who was known at this time as Jodi Gold, before she was married in 2005—it shows she underwent an MRI at St. John’s medical center in Los Angeles on May 11th of 2000, where they found a two centimeter mass, which they suspected was cancer. The pathology department at St. John’s performed a biopsy four days later, and confirmed that she did indeed have a malignant brain tumor. Ordinarily the FDA requires that anyone that wished to be a part of Dr. Burzynski’s trials, must first have already undergone chemotherapy and radiation—and failed. However, since Jodi’s tumor was so aggressive and her prognosis severely grim, she managed to get “special exception status” to be placed into this trial without undergoing any other prior treatment whatsoever. An MRI on June 1st of 2000, revealed the size of the enhancing portion of Jodi’s tumor, which was the part of her tumor that was the most aggressively growing. On June 6th, she started Antineoplaston treatment, and by July 3rd, only a month after starting treatment the enhancing portion of her tumor was gone. Her tumor remained non-existent up until October of the following year, when she stopped her Antineoplaston therapy altogether. It’s one thing to be shown a single anecdotal case with this type of brain tumor, and it’s another to simply compare clinical trial data of inoperable anaplastic astrocytoma patients treated with toxic radiation and chemotherapy, versus, clinical trial data using only Dr. Burzynski’s non-toxic Antineoplaston therapy. A 2005 clinical trial report using only radiation and chemotherapy, found that 5 of 54 patients, or 9%, were cancer-free at the end of treatment. While a 2008 clinical trial report using only Antineoplastons, found that 5 of 20 patients, or 25%, were cancer-free at the end of treatment—with no toxic side-effects. Jodi Fenton is one of them. 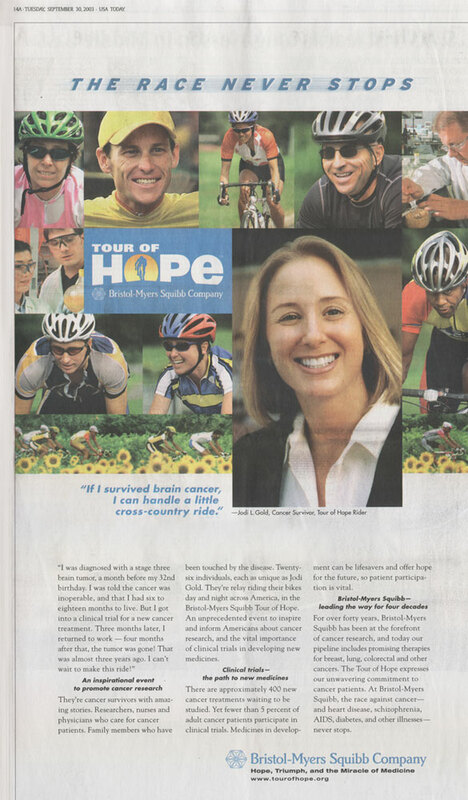 EXTRA: Bristol-Myers Squibb placed Jodi in a full page ad for the “Tour Of Hope” ride, not knowing she was cured using Antineoplastons, not by any of the therapies this ride was raising money for. EXTRA: Watch Jodi on CNN next to Lance Armstrong for the “Tour Of Hope” ride. If Jodi Fenton had undergone the therapies originally prescribed to her, her life would have been very different. Now she is alive, well, and prospering. It’s as if she had a bacterial infection, and Dr. Burzynski treated it with antibiotics. Four years after my diagnosis, I had run into one of the neuro-oncologists I had met with, and told him that I had gone to Dr. Burzynski and I was cured, and he kind of wrote it off. I was very excited to tell him that I was cured, and he really burst my bubble about it. So it was somewhat depressing for me. Jodi is talking about Dr. Keith Black again. Another doctor that I have, when I told him that I had anaplastic astrocytoma, he was very excited, he was like “bleep! bleep! bleep! I can’t believe this is you, because do you know what the prognosis for this is?”, and I said yes. He said “I can’t believe you survived this”, and he was very excited for me. IMPORTANT EXTRA: FDA-sanctioned Phase II studies for Anaplastic Astrocytoma using Antineoplastons are now completed, peer-reviewed, and published in 2015.